Why buy each separately when we have the combo case? 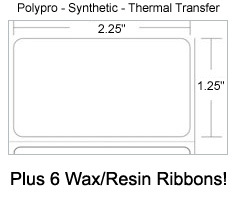 Polypropylene thermal transfer labels and Wax/Resin ribbons - Requires Zebra TLP 2824. This label and ribbon combo produce water resistant and heat resistant printed labels for long lasting, easy scanning. Resistant to scratching and smearing, temperatures up to 250 degrees F (121 degrees C) and 1-2 years outdoors. Requires Zebra TLP 2824. Please call us if you have questions.